Wine and golf! Has there ever been a more delicious juxtaposition of delights? Paul Trow takes readers on a whistle-whetting tour of France’s standout courses, with considerably more than a passing nod to some degustation along the way. Despite dubious claims from jealous rivals, France is still the world’s leading tourist destination, welcoming more than 75 million visitors each year. 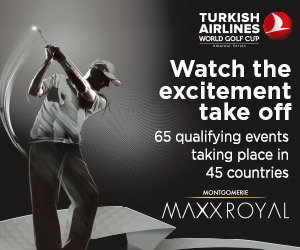 Granted only a tiny percentage of them go there to play golf, but this is just as well because otherwise the country’s 600 or so courses would be as overcrowded as Gare du Nord train station in the Paris rush hour. However, this does not mean the French are not serious about cultivating the loyalty of visiting golfers. For the best part of two decades, it has been public policy for regional governments to support, with up to 50 per cent financial subsidies in some cases, any private developers committing to build new courses. The upshot of this enlightened policy is that France is fast developing as a viable (and less expensive) alternative to longer-established European golf destinations like the Algarve and Costa del Sol—in southern Portugal and Spain respectively. Not only does its intricate network of airports enable golfers to jet directly in to any region they fancy, but motoring visitors are similarly spoiled for choice as they drive across the country. As with everything else in France, its golfing variety is the spice de la vie. The different regions each have their own gems, unique in character and memorable for aesthetic as well as playing reasons. Indeed, golf is only part of the story. How about France’s history, culture, food and, above all else, wine? Visitors in search of golf courses will not cross the Massif Central, perhaps even the Atlantic Ocean, in search of birdies alone—there have to be a few diversions along the way. Over the next few pages, Kingdom identifies an outstanding golf course in each region and drops a few hints about the wines that are likely to be on offer in the clubhouse. Playing at Barbaroux is like being anywhere in the world on the same day. Some holes make you think of Ireland while others could have been transported from a Scottish links. Pete Dye and his son P.B. have incorporated six vast lakes around the vineyards that also form part of the attraction. The undulating fairways and the design of the greens (with some blind approach shots) make this 1989 design a tough test, especially as many seemingly good shots will go unrewarded. also in provence: The Four Seasons resort at Tourrettes a few miles inland from Cannes is home to the Terre Blanche club which has two 18-hole hillside courses (Le Chateau and Le Riou), designed by former British Ryder Cup player Dave Thomas, and a David Leadbetter golf academy. Local wine: Provence, perhaps the warmest wine region in France, produces mainly rosé and red wine. It covers eight major appellations led by the Provence flagship, Bandol. Some Provence wine can be compared with the southern Rhône wines as they share both grapes and, to some degree, style and climate. Provence also has a classification of its most prestigious estates, much like Bordeaux. Situated 18 miles northeast of the town of Rouen, Saint-Saens is an undulating, tree-lined course crossed by the La Varenne river that comes into play on several holes. Located near Baryon village and surrounded by the Fawy forest, France’s first beech grove, this is a fabulously picturesque place to play. Denis Robinson, who designed the course in the late 1980s, has used these natural elements to manufacture a pleasant test of golf. The clubhouse is a spectacular 19th century chateau that serves traditional Normandy food. Local wine: Arpents du Soleil in the heart of Calvados, near the northern cities of Caen and Bayeux, is known for producing excellent wines, largely due to the area’s dry and sunny microclimate, and the richness of the soil’s mineral and calcium content. Most Normandy wines are white, but reds are produced as well. The prominent grapes are: Melon de Bourgogne, Auxerrois, Pinot Noir, Muller-Thurgau and Pinot Gris. Laid out alongside Le Chemin des Dames (literally ‘the ladies’ path’), the site of three First World War battles some 15 miles northwest of the historic city of Reims, L’Ailette is a gently undulating, high-quality public course. Michel Gayon’s 1988 creation through open woodland cleverly alternates more easily playable holes with tougher challenges to set a pleasant tempo and give players a breather. Most of the difficulties are caused by elevated greens which are generally quite large and well protected by neatly designed bunkers, although water does encroach on three holes on the back nine. Local wine: Champagne, in northeast France, is the country’s coldest wine region and home to its iconic sparkling wine. Champagnes can be both white and rosé. A small amount of still wine is produced in Champagne, some of which is red. When visiting the vineyards of Reims and Epernay, where names like Moët et Chandon, Veuve Clicquot and Bollinger cut their teeth, why not seek out some lesser-known marques? Like Billecart-Salmon in Mareuil-sur-Ay, still owned by the family that founded it in 1818 and producers of a superb rosé; Gosset, the oldest winery in the region (founded in 1584); or Pierson Whitaker, showcased in a beautiful 19th-century house in Avize. Designed by the late Robert Von Hagge and Hubert Chesneau, this course, where the French Open now has its permanent home, was opened in 1990 on a (once) completely flat piece of land. Not that you would know it now, as the course winds up and down artificial dunes to create a golfing experience that is a mix of links and American-style holes. The greens are well defended and the slightest slip-up can sabotage a scorecard. Eighteen miles southwest of Paris, L’Albatros is rightly acknowledged as one of Europe’s outstanding courses. Also in ile de france: The Vignoly course at the 36-hole Crécy Golf Club, 25 miles northeast of Paris, is France’s first, and to date only, Arnold Palmer Signature Course. A tough test, it was designed (in 1989) to stage national and international tournaments. Local wine: Wine production in and around Paris is modest. The region now produces 33,000 bottles a year from 11 hectares of vineyards. The grapes generally are Chardonnay, Pinot Noir, Semillon and Sauvignon, and the best wines are sparkling. It’s difficult to buy them, except those produced in Suresnes. Other varieties can be tasted through Autour du Vin events organized by the Ile de France winegrowers’ association. Situated 16 miles north of the historic ports of Bayonne and Biarritz, this Von Hagge design opened in 1989. It’s a hilly course with narrow fairways. Translated into golfing reality, this means that if your game isn’t in shape you could be in for a torrid few hours. It provides a searching examination of the golfer’s course management skills but even though there are some lengthy walks between greens and tees, Seignosse is not especially long. Accurate iron play is the key and the heavily-contoured, multi-leveled greens require precise approaches. Also worth a visit in this golf-rich region are: Chiberta, laid out through a pine forest by Tom Simpson in 1927; Moliets, a Trent Jones parkland layout just north of Seignosse; Makila, Rocky Roquemore’s pride and joy in the hills just outside Bayonne; Hossegor, a flat, parkland facility that dates back to 1930; and d’Arcagnes, a picturesque Ronald Fream design in the foothills of the Pyrenees. Local wine: You can count the departements of Aquitaine on the fingers of one hand: Gironde, Dordogne, Lot-et-Garonne, Landes and Pyrénées-Atlantiques. The five include no fewer than 14 wine regions, each with its own Destination Vignobles System. 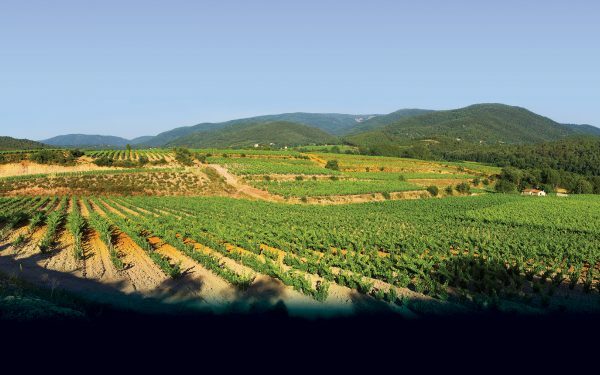 This is France’s most productive wine region, occupying 144,000 hectares (14 times the size of Paris!). From Bordeaux to the Baïse River, from Bergerac to the hills of Irouléguy, wine lovers will be in their element. With an abundance of broom and gorse, this seaside course retains a Scottish feel even though some holes could be described as parkland. Those who have played links golf in Scotland will appreciate that when the wind blows Dinard plays a lot longer than its yardage and club selection to small, well bunkered greens can be tough. The Art Deco clubhouse serves superb steak frites—the prefect riposte to a buffeting from the wind. Local wine: Like Normandy, Brittany is a strong cider region, but several varietals—Muscadet, Merlot and Gros Plant—also thrive here. While visiting Brittany, try the local shellfish with a bottle of Gros Plant, a robust, full-bodied wine with a strong bouquet, though perhaps a touch too acidic for some palates. Les Bordes was founded by Baron Marcel Bich (of Bic pens fame) in 1986. He wanted to create a world-class golf and residential resort in a Loire Valley deer park and achieved his objective thanks to Von Hagge’s groundbreaking design—a tough woodland layout featuring water on 12 of the 18 holes. A second 18, which Von Hagge designed just before he died in October, will open in 2013. The restaurant, offering a full range from bar snacks to cordon bleu fare, is highly recommended. Local wine: This is primarily a white-wine region that stretches the full length of the Loire River in central and western France, and where grape varieties and wine styles can vary enormously. Along the way, we will find: Sauvignon Blanc, which yields wines such as Sancerre; Touraine, producing cold climate-styled white wines from Chenin Blanc; and Muscadet from the Melon de Bourgogne grape. Dating back to 1597 but now a luxury hotel, Château des Vigiers forms the centerpiece of three spectacular 9-hole loops (La Vallee, Les Vignes and Le Lac) designed by Donald Steel who specializes in “natural” golf course architecture. The original 18 holes were opened in 1991 and the third nine was introduced two years ago. Laid out amidst plum orchards, oak woods, lakes and vineyards, the course, located about an hour’s drive due east of Bordeaux, is maintained with short rough to promote quick play and accommodate higher handicappers as well as better players. Local wine: Gironde is the Dordogne’s main wine-producing region and its roll call of wines says it all: Barsac, Bordeaux Supérieur, Cadillac, Canon-Fronsac, Cérons, Côtes de Blaye, Côtes de Castillon, Côtes de Francs, Fronsac, Graves Supérieur, Haut-Médoc, Lalande de Pomerol, Listrac, Loupiac, Margaux, Moulis, Pauillac, Pessac-Léognan, Premières Côtes de Bordeaux, Pomerol, Sainte-Croix-du-Mont, Saint-Emilion, Saint-Estèphe, Saint-Julien, Saint-Macaire, Sauterne. Ladies and gentlemen, take your pick! Bernhard Langer and Kurt Rossknecht have landscaped a golfing paradise in the leas of the Rhine Valley, less than half an hour’s drive from the city of Strasbourg and the town of Baden-Baden, just across the border in Germany. With 18 lakes that affect play on 14 of the 18 holes and numerous greenside and fairway bunkers, Soufflenheim, which opened in 1995, represents a stern test of golf. But it is also a visual delight. Shielded by dense woodland, it has been enhanced of late by the club’s program of planting shrubs, small trees and bushes across the course. Local wine: Alsace is primarily a white-wine region, though some reds and rosés, along with sparkling and dessert wines, are also produced. Its grape varieties include Riesling, Gewurztraminer, Pinot Gris, Pinot Blanc, Pinot Noir and Muscat. Perhaps the archetypical Alsace wine is Gewurztraminer—an aromatic grape that performs best in cooler climates with a pink to red skin color. It has high natural sugar content and shares the same aroma compounds as lychees. The Evian Masters course is part of the Royal Parc Evian, one of the world’s most exclusive resorts. Overlooking the shores of Lake Geneva, the complex has two hotels (the Royal and the Ermitage), two spas and a casino. The club hosts the Evian Masters tournament on the LPGA Tour each year and is set at the heart of a 60-hectare wooded park. Created in 1904, the course was totally re-designed by Cabell Robinson in association with Robert Trent Jones Sr. and is now a challenging test of anyone’s game in superb surroundings. Local wine: Although primarily a red-wine region in southeast France, the styles and varietal composition from north to south differ markedly. Within the region’s general ambit, we find: Savoy, primarily a white-wine region in the Alps close to Switzerland; Jura, a small mountainous region, also close to Switzerland, where some unique wine styles, notably Vin Jaune and Vin de Paille, are produced; and Burgundy, where red (Pinot Noir) and white (Chardonnay) wines are equally prolific. La Grande Motte may be a 42-hole, vacation-resort complex, but its championship layout, ‘Les Flamants Roses,’ is really special. Designed by Robert Trent Jones in 1987, this Florida-style course is located on the edge of a lagoon, a short walk from the beaches. Water is a constant threat though the course is fairly flat and easy to walk. However, if the wind gets up it can become a tough test. Its location—12 miles from the Mediterranean city of Montpellier—means that golfers can combine a family holiday with a few rounds. Local wine: This is the largest region in terms of vineyard surface, and the amount of cheaper wine that is produced. While still the source of much of France’s and Europe’s overproduction, the so-called “wine lake,” Languedoc-Roussillon is also home to some innovative producers who combine traditional French and international styles with New World techniques. Readers should note that local wine is often sold as Vin de Pays d’Oc. You can’t forget you’re in the heart of wine country here as each hole is named after a Médoc vintage and the 150-yard markers are wine bottles. However, this course more resembles a Scottish links than anything else. Built by Bill Coore in 1989 on land reclaimed in the 17th century, Les Chateaux has fast greens and the wind whips in off the Atlantic. This challenging set-up will test even the finest exponent of links golf. The other course at Golf du Médoc is Les Vignes, which was opened in 1991. Local wine: Bordeaux has a long history of exporting wine. It’s primarily a red wine region, famous for names like Château Lafite-Rothschild, Château Latour, Château Margaux and Château Haut-Brion from Médoc; Château Cheval Blanc in Saint-Émilion; and Château Pétrus and Château Le Pin in Pomerol. The reds are usually blended, from Cabernet Sauvignon, Merlot and sometimes Cabernet Franc. Bordeaux also makes white wines, including Sauternes such as Château d’Yquem. As spectacular a course as you will ever play, Robert Trent Jones Sr.’s masterpiece on the south coast of the French island of Corsica has drawn comparisons with Pebble Beach. The course is surrounded by heather, gorse and scrub, and has six holes perched on the cliff top with views of Sardinia to the south that will alone make the day memorable. Sperone, now 20 years old, is not particularly long but it’s tough due to its exposed layout, difficult sloping greens and the wind whipping in off the sea. This absolute gem is also only a 45-minute ride by ferry from Sardinia. Local wine: The wines produced on this mountainous Mediterranean island tend to be consumed domestically. It has nine wine-producing regions and mass production is still very much a work in progress. Most prevalent are its rosé and white wines, which must be drunk young and fresh, but its reds are also surprisingly smooth.